Isabella Valentine was raised with love as a member of the noble English Valentine family. However, her father, Count Valentine, grew obsessed in mystery and drove the family into despair. The count died in madness and the famous Valentine family was ruined in a single generation. Her mother died soon thereafter, but not before revealing that Isabella was adopted. Her mother never told her who her true parents were, but the devastated Isabella could not have cared less. One day Isabella discovered her father's diary. It detailed the count's obsession with alchemy and the investigation into a sword named Soul Edge, which was rumored to be the key to immortality. Desiring to follow her father's dream, Isabella became an alchemist and began to pursue the trail of Soul Edge. She learned more and more about the sword and the people who had pursued it. 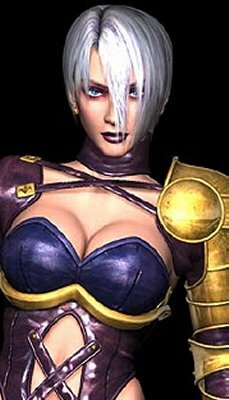 When she discovered the true nature of Soul Edge, however, she became appaled that her father had been driven mad by such an evil object. She formed a new goal in life: To destroy the sword and cleanse her family's name. Isabella began to prepare for the day when she would destroy Soul Edge. To destroy such a powerful sword, she would need a weapon that was even more powerful. She used all her skill to create a weapon that could change it's form from a whip to a sword. Even though the sword was a technological marvel, it was still just a lifeless tool that could not hope to match Soul Edge's demonic power. In order to unleash the sword's true potential, Ivy would need to give it life. However, this was a difficult task to accomplish. Isabella tried everything she knew of but soon found that her alchemical knowledge was useless. In desperation, she began to explore ancient sorcery and repeated summoning rituals every night at midnight. She soon became like her father, obsessed, frustrated and filled with rage. One night, however, her spells produced some results. A malformed arm was summoned to the summoning gate. The arm, sensing Isabella's attachment to her sword, fused itself to the sword. A voice then entered Isabella's mind, saying: "I, Cross of the Pledge, shall confer onto thee the Point in the Escutcheon of Destruction - Dexter Purpure." Then the being dissapeared and the ceremony ended. Unbeknowst to Ivy, the being had actually been a fragment of the Soul Edge, the very sword she sought to destroy. Because of the sword's evil influence, Isabella's mind snapped. Her sword was complete, but her desires had been twisted. The demented Ivy then began her search for the evil sword. Her travels led her to a German castle, where she found an azure knight known as Nightmare. Recognizing his arm as having been the being she summoned, she offered to help Nightmare in his quest for resurrection. After a time, she grew to dislike Nightmare's accomplices, Astaroth and Lizardman. She soon reached her limit and saw Nightmare's actions as brutal and senseless. It seemed to her that the trio was pure evil, and decided that she no longer wanted to be part of their quest. One night, she decided to leave the castle. Utilizing an underground passage to avoid detection, she was nonetheless discovered by Astaoroth and his subordinates. The two began to battle, and during the fight she learned that Nightmare's sword was indeed the blade she had been searching. She also caught a stray remark from Astaroth about her being a "spare host" for the Soul Edge. The battle ended with Astaroth's victory, but he left Ivy for his clay golems to finish. She escaped the mindless brutes easily, and was on her way to confront Nightmare directly when she was intercepted by Taki. Ivy was in no shape to fight the skilled ninja, and was defeated. Taki then revealed to Ivy that she was the "Child of the Sword." It was not long before Ivy discovered her true lineage: She was the daughter of Cervantes. Angry at having been decieved, Ivy nonetheless came to terms with the truth. She realized that even though Nightmare had been defeated, the cursed blood that flowed through her veins was Soul Edge's life source and thus the sword was not truly dead. However, she felt as though a great weight had been lifted from her and she set out on a new quest.